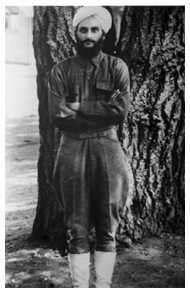 Bhagat Singh Thind (1892-1967) was born in Punjab and came to America in 1913. A year later, he was paying his way through the University of California at Berkeley by working in an Oregon lumber mill during summer vacations. When America entered World War I, he joined the U.S. Army. He was honorably discharged on 16th of December, 1918 and in 1920 applied for U.S. citizenship from the state of Oregon. Since several applicants from India had thus far been granted U.S. citizenship, he too was approved by the district court. However a naturalization examiner appealed this court's decision, and the rest is history. 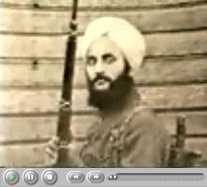 What is less well-known is that Bhagat Singh Thind remained in the U.S., completed his Ph.D., and delivered lectures in metaphysics all across the nation. Basing his lessons on Sikh philosophy, he enriched his teaching with references to the scriptures of several religions and the work of Emerson, Whitman, and Thoreau. He campaigned actively for the independence of India from the British Empire, and helped Indian students in any way he could. In 1931, he married Vivian Davies and they had a son, David, to whom several of his 15 books are dedicated. Based on lectures given in 1927, this book is a fine introduction to Dr. Thind's teachings. It is easily understood by and popular with young people, as well as more advanced students of Eastern religions. A few of the chapter titles are: How to Find Out What You Are Best Suited For; Evolution  Passing from Lower to Higher Births; Consciousness  An Inward Knowledge; Aum  The Sacred Hum of the Universe. "Appeal to the tradition of a nation, and the whole mob psychology is arrayed behind you. Let me appeal to the democratic spirit of the Americans, and they think I am just wonderful. Appeal to the spiritual nature of India, and you get all Hindus on your side." Dr. Thind's disciples count this book as their teacher's greatest writing. It deals with enduring truths of spiritual import, verifiable facts of the highest human psychological possibilities. Dr. Thind reveals an exact science showing the seeker how to connect the individual soul with its Universal Creator. In the Preface, he writes: "It [this book] is for him who seeks to illumine his intelligence by the torch of his own Divinity, who hungers to attain the Consciousness, which transcends the barriers of time and space." 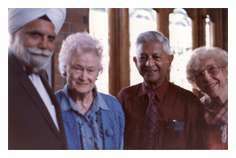 From left: Dr. Amarjit S. Marwah, Mrs. Vivian Thind (Bhagat's widow), Mr. Ram Bagai, and Gwen Singh (widow of another Indian pioneer). "The truest help one can render a man bent with the burdens of life, is to call out his best energies and efforts, so that he himself by himself may raise his sagging spirit, and not only cope with conditions, but come out triumphant in the highest spiritual sense of the word." This quotation from the Preface is an expression of what Dr. Thind hoped to accomplish with this book. Chapters include: Union with God; the Unknown Is in the Known; Ego vs. Individuality; Unification and Reunion; Sikh Religion Made Plain; The Song of the Soul Victorious. "No scientific law can ever compare with the discovery of the Living Word of Power, which unifies man's whole being and makes him one in nature and character with his indwelling God." This is the theme developed by Dr. Thind in this book  an inspiring volume for all who seek to go ever onward, forward and Godward. Chapters include: Modus Operandi; Walking in the Inner Path to God; How Sat Guru Helps; Nature, Nurture and Nam; Overcoming the World. "The human mind is where everyone has to live and find his only opportunity for peace, happiness and wholeness. Only the unified mind can see things whole." "There are many religions, but only one Morality, one Truth, and one God. The only Heaven is one of conscious life and fellowship with God." These three volumes were written for all who have freed themselves of orthodox religious thinking and for those who are ready to do so. The books serve as a springboard to greater spiritual heights, wherein we appreciate more than ever the message of the Sat Gurus, the Saviours, the Avatars, the Christs, of whom Jesus Christ was one. Dr. Thind analyzes the teachings of this Savior of the western world and compares them with the teachings of all the great religions.